Gold owners are almost universally familiar with the story of Franklin Roosevelt criminalizing the ownership of gold back in 1933. Roosevelt further ordered that citizens in the Land of the Free surrender their gold to the Federal Reserve in exchange for $20.67 per troy ounce in Federal Reserve notes. The term gold ‘nationalization’ is often thrown around. But remember, with nationalization, it’s the state that takes control of an asset. Executive Order 6012 took assets from private individuals, and then gave those assets to a private company – the Federal Reserve. This isn’t nationalization. It’s just theft. You’d think that the entire nation would have been in an uproar. But surprisingly, this wasn’t the case. 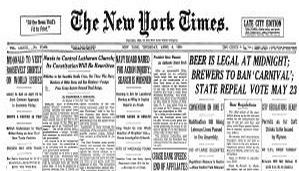 In fact, the Executive Order didn’t even make the front page of the New York Times, whose main headline the day after was “BEER LEGAL AT MIDNIGHT”. It just so happened that prohibition was starting to be repealed right when Roosevelt’s order was going into effect. So people were too distracted with their pent-up, alcohol-induced euphoria to really notice. Very clever timing. Of course, Roosevelt was not the first, nor the last, to confiscate citizens’ gold. One of my favorite stories involves Charles I of England, who commandeered 200,000 pounds of gold in 1638 as the English Civil War was approaching. This gold belonged to private citizens, not to Charles. The rightful owners trusted their king and were storing their gold at the national mint for safe keeping. This trust proved to be misplaced. And Charles seized the gold, calling it a ‘loan’ (upon which the English government subsequently defaulted). This theme is consistent across history– governments have a notorious, unblemished track record of fleecing their citizens, particularly in times of desperation. History shows that the likelihood of a government pillaging its citizens’ wealth is directly proportional to that government’s fiscal health. Nearly the rest of the West is in the same position, or worse off, than Cyprus– overextended banking systems, interminable deficits, unsustainable debts, and strong precedents of setting the law aside to violate people’s freedom. All the warning signs are there. And just as in Cyprus, or in 17th century England, it’s going to be so obvious looking back. This is one of the reasons why it’s so important to be proactive now and move a portion of your assets abroad where they can’t grab it. As an example, there’s a fantastic private, secure storage facility here in Vienna called Das Safe that I’ve been writing about for a long time. Das Safe has been around for three decades. And because they’re not connected to any bank or government, it’s possible to anonymously rent a safety deposit box where you can store gold. Under current US law, this is not reportable… so you can truly hold your savings privately, outside the banking system. Of course, gold is just one asset to think about. There’s another asset that I’m even more concerned about governments stealing: retirement accounts. More on that another time.